All transactions are safe and secure with a reliable history in online purchasing behind each of our associates. Buy the Karate Kid Skeleton Costume Cobra Kai to own Karate Kid clothing and merchandise. 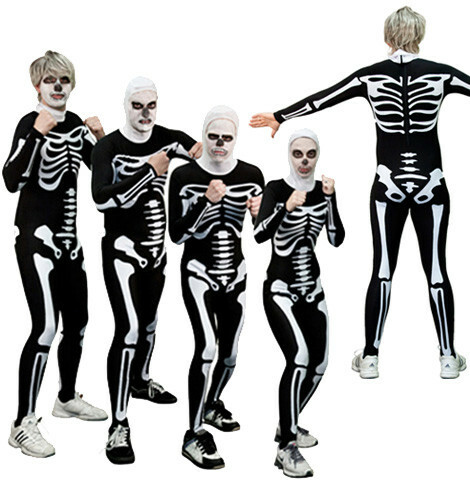 Gather a group of friends and go to your next Halloween party in these high quality replica Cobra Kai skeleton costumes. The spandex bodysuits were constructed using the same process that the filmmakers used on the set. The bones, which are made from the same spandex material as the suit, are sewn on by hand to ensure that each piece of the skeleton is in its proper place. Unlike lower quality Karate Kid Halloween skeleton costumes, the bones cover the front and back of the bodysuit and are able to stretch with the outfit. In addition to the Karate Kid Skeleton Costume Cobra Kai above, browse the Karate Kid Clothing Gallery for more apparel like men's and women's clothes, kids shirts or hoodies.